So I'm feeling a little empowered today. With all the craziness in our world I feel like I have gained a little control over a small portion of my life. What did I do? What I think everyone else should do. Bargain. I went to the grocery store today to pick up a few potatoes for supper, I needed a quick starch after Daniel and I ate a loaf of bread in record time. And being I refuse to buy bread, potatoes seemed like a good option to go with my clean out the fridge quiche. So after finding my potatoes, being I am not a man and I don't shop like one I meandered around a bit. I headed to the dairy case (my favorite place in the grocery). And what did I find? Cream top (pasturized, but non-homogenized milk), I was so excited. I have been wanting to try some of this milk but it is hard to find, and after searching for a few weeks I gave up my search. But here were 2 pretty glass bottle with a nice creamy layer on top of the milk. Unfortunately the bottles had an expiration of today, so I asked to talk to the manager and asked for a deal. Guess what? I got a great deal. In my experience of grocery bargaining, grocery stores are so busy trying to turn over stock they loose track of items nearing expiration at times. So if you see something you want past its peak, ask. Warning: not every store manager is going to care. Some mega store employees don't care about anything but their paycheck. By the way I decided to make yogurt with my almost expired milk, cultured dairy lives a lot longer. Plus I had some yogurt starter I needed to use up. I found your blog from Mindy's blog links and I've been enjoying reading your posts. I've known Daniel since childhood and I'm sure you and I have met at some point. 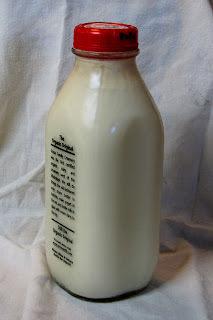 Just had to mention that I also LOVE glass bottle milk. I only ever buy glass bottle milk from a local dairy, which, fortunately, is sold in most of our grocery stores here in this part of KS. I love it when I find it near expiration date and can manage to get a bargain. And we just LOVE the fresh taste of the milk. Plus, it makes delicious homemade yogurt. I was so delighted to see this post! And congrats on the coming baby!